The Markt has been the commercial center of the town and actually it partly still is. There still is a market on the square every Wednesday morning. 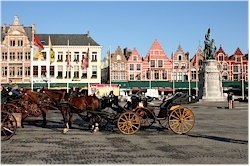 The Markt is largely pedestrianized and is used for a number of different events. During the Christmas market for example, a big ice skating ring is placed here. The most known building is the cloth hall with its belfry tower, that was built around 1240 [more information on the belfry]. Because the cloth hall had become too small, in 1284 a second hall was constructed: the waterhall. This large gothic covered hall stood over the Kraanrei (which has been filled up in the meantime). Goods that were transported via the water could thus be traded immediately. The waterhall was demolished in 1791 during the French occupation. In its place, new buildings were erected, however most of those were destroyed during a fire in 1878. 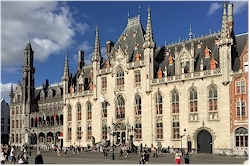 On that place, the impressive neogothic complex of the Provincial Court was built. There were also several guildhouses on the Markt such as the one of the tile dekkers ("het Mandeke") and the one of the fishmongers which have become restaurants now. 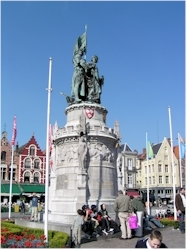 The statue in honour of Jan Breydel and Pieter de Coninck stands in the middle of the square. They are known for their contribution to the "Brugse Metten" and the Battle of the Golden Spurs (1302). In that battle that was fought near Kortrijk, the army of French knights were defeated by the Flemish. The Markt is an ensemble of beautiful facades of which a number of very typical stepped gables.